* I hear America singing: an anthology of folk poetry. Collected by Ruth A. Barnes. Illustrated by Robert Lawson with an introduction by Carl Van Doren. New York: Junior Literary Guild; John C. Winston, 1937. 346 p.
See: "Hittin f'r the westward" p.3-25; "Out in the west where the riders are ready" p. 55-79. Immortalia: an anthology of American ballads, sailors' songs, cowboy songs, college songs, parodies, limericks, and other humorous verses and doggerel, now for the first time brought together in book form by a gentleman about town. Attributed to Thomas.R. Smith [George Macy]. New York: Macy-Masius and Jacob Baker, 1927. Immortalia : an anthology of American ballads, sailor's songs, cowboy songs, college songs, parodies, limericks, and other humorous verses and doggerel, for the first time brought together in book form in 1927, by a gentleman about town. Long Beach, CA : Immortalia Press, 1975. 184 p.
In the pine: selected Kentucky folksongs. Collected by Leonard Roberts. Music transcriptions by C. Buell Agey. Consultant Jan Philip Schinan. Pikeville, KY: Pikeville College Press, 1978. 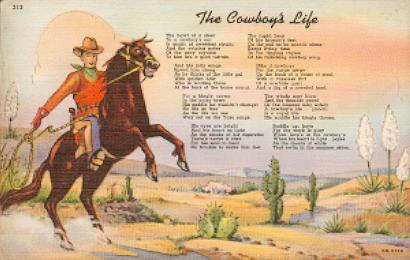 319 p.
See "American ballads": "Dying cowboy" p.120; "Trail to Mexico" p.122; "Cowboy song" p.173, "Cowboy Jack" p.184. "A.F. 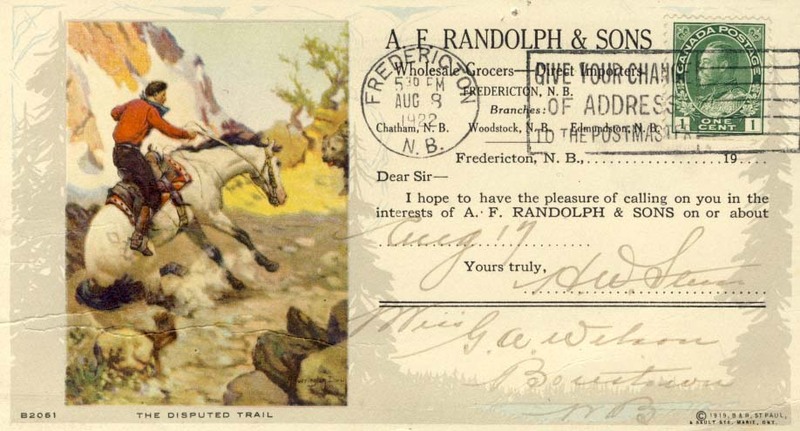 Randolph & Sons: The Disputed Trail." * Ings, Frederick William. Before the fences (tales from the Midway Ranch) / Frederick William Ings. Edited by Jim Davis. [Nanton, AB: Nanton Historical Society], 1980. A printing of Ings' 1936 biography. See: "The trail of an oldtimer's memory," p.111; "The old-timer," by J.F. Hamilton, p.185. International cyclopedia of music and musicians. Edited by Oscar Thompson. New York: Dodd, Mead Co., 1964. See p.715. Into the wilderness dream: exploration narratives of the American West. Edited by Donald D. Barclay; James H. Maguire; Peter Wild. Salt Lake City, UT: University of Utah Press, 1994. * Isherwood. W.S. Occasional sketches: collected and published by his son, L.W. Isherwood, for distribution among friends / W.S. Isherwood. [Austin, TX: L.W. Isherwood, 1898]. See: "On to Llano" p.16; "Camp life in Texas" p.23-24. Iverson, Peter. "Neihardt, Collier and the continuity of Indian life." p.100-109. In A sender of words: essays in memory of John G. Neihardt. Edited by Vine Deloria, Jr. Salt Lake City, UT; Chicago, IL: Howe Brothers, 1984. Ives, Charles. [1874-1954]. Seven songs for voice and piano / Charles Ives. New York: G. Schirmer, 1921.